Greater Manchester bus route 42 operates in Greater Manchester. 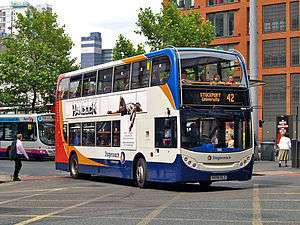 It is operated by First Greater Manchester and Stagecoach Manchester on a common section between Manchester Piccadilly bus station and East Didsbury. First Greater Manchester operate an extension at its northern end from Manchester Piccadilly to Middleton bus station and Stagecoach Manchester an extension at the southern end from East Didsbury to Stockport bus station. Route 42 was historically operated by Finglands Coachways and Stagecoach Manchester between Manchester Piccadilly bus station and East Didsbury. UK North also operated services in the mid-2000s. Following the sale of the Finglands business to First Greater Manchester on 9 February 2014, the new operator extended its route 42 services to become a cross city service from North Manchester General Hospital under the Cross Connect banner on 26 April 2014. This service further extended to Middleton bus station on 12 April 2015.